CBAC Forecaster's Blog: What's With All The Scary Danger Ratings? What's With All The Scary Danger Ratings? 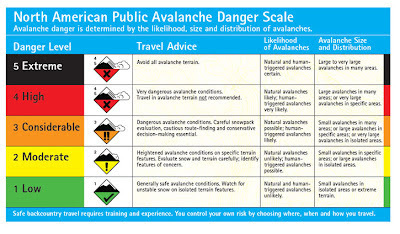 I'll start off our forecaster's blog with a write-up of the avalanche danger scale and our thought process behind interpreting and assigning avalanche danger ratings this season. Forecasters around the state have been scratching their heads and going back and forth about defining and issuing avalanche danger ratings this season. Our tricky snowpack has forced us to dig into the nuances and semantics of the 2010-2011 North American Danger Scale (Fig. 1). So what goes into the danger rating? It all starts with the forecasters assessment of snow stability and how the current and future backcountry conditions fit with the avalanche danger definitions. The forecaster looks at the likelihood of both human-triggered and natural avalanches as well as the size and distribution of avalanches. Each level of avalanche danger has a specific definition for those categories (Fig. 1). Easy enough, right? If it could only be so simple! It has been very challenging here at the CBAC to attach an avalanche danger rating to our snowpack since the first major storm of 2012 arrived on January 16th. We have been reading (and re-reading) all the qualifying and defining traits of each danger level and assigning danger based on those definitions. Each morning, we look at the probability of both natural and human triggered avalanches and then think about how big avalanches will be and where they will be occurring in the terrain. The resulting product has been a strict interpretation of MODERATE or CONSIDERALE danger that appropriately sums up the avalanche conditions but does not necessarily connote how "dangerous" it is out there. This is where the "SCARY" modifiers have been coming into play this season. While not an official danger rating, forecasters often attach or imply the "SCARY" pre-fix during times when the danger is at the upper end of either MODERATE or CONSIDERABLE. Often times during SCARY MODERATE, there is a lower probability of human-triggering an avalanche but the resulting avalanche has the potential to be very large, and deadly. We dealt with SCARY CONSIDERABLE after the January 16th storm. 1.3" of water fell on a mostly shallow and weak snowpack. The danger did not spike all the way to HIGH because the size and distribution of avalanche activity did not fully meet the HIGH requirements. We did not see "large avalanches in many areas"-- a clause that helps define HIGH danger. Instead we observed "small avalanches in many areas and large avalanches in specific areas"--two of the defining traits of CONSIDERABLE danger. It was SCARY CONSIDERABLE because we were pushing the limits of the definition, but the way the storm and subsequent avalanche cycle played out fit into CONSIDERABLE danger. During the peak of the storm--the night of 1/16--the probability of human triggered avalanches may have jumped to "Very Likely"--a defining trait of HIGH--but the natural activity observed over the next several days all pointed to the fact it was CONSIDERABLE danger. The storm that arrived the following week--the January 22nd storm--dropped over 2" of water onto our weak, top-heavy snowpack. The danger jumped to HIGH post storm due to the combination of a larger load of snow, winds, and our increasingly unstable snowpack. The result of that storm was a spike in danger to HIGH for 24 hours. More larger avalanches were observed after the 1/22 storm than the 1/16 storm and HIGH danger was warranted. The danger then hung out at CONSIDERABLE for the next 2 weeks on many aspects. Why? Naturals weren't occurring, but human triggered avalanches were "LIKELY" on most slopes. Going back to the definitions (Fig. 1), "likely" triggers are enough to keep the danger at CONSIDERABLE. Also, all the reports of cracking and collapsing hinted that remote triggered avalanches were a real possibility as were "large avalanches in specific areas and very large avalanches in isolated areas." Currently we are at SCARY MODERATE. Human-triggered avalanches are no longer "likely," but they are "possible" and even very possible on certain slopes. Why is the "Scary" pre-fix still being tossed around the forecasting community? We use the term SCARY MODERATE during times when the probability for triggering an avalanche is slowly decreasing, but the consequences remain severe and even deadly. The Bottom Line: Our snowpack remains dangerous despite the fact it is getting harder to trigger an avalanche. Don't let decreasing signs of instability lure you into exposed and consequential terrain. Many fatal avalanches or close calls (think Lucky Boy Slide on Whetstone) occur during SCARY MODERATE danger. Do not let your guard down and treat all slopes over 35 degrees with extra caution.